2. For the Most Perfect Baby: The Bla Bla dolls are the most sought after and coveted stuffed animal that is in exsistent. The CROWN Jewel to any baby’s stuffed animal collection. If you want to go down in history in any parents book as the BEST ever, then a Bla Bla doll, like this lamby, is the perfect gift this Easter. 3. For the neighbor kid /or kid you nanny: This Jelly Cat mini bunny makes the perfect gift for that neighbor kid that melts your heart every time they wiz past your house on their bike. Or if you are a nanny, then this is the gift to give to those sweet children that have a piece of your heart, even if they drive you bananas every once in a while. 4. For a Neighbor Gift: With spring in the air, everyone is out and about soaking up the sunshine and getting ready to plant their gardens. We have a great selection of potted succulents that are sure to spread some of that spring cheer. 5. Easter Brunch Gift: Have you been invited to Easter Brunch and don’t want to show up with just ice? These Meri Meri bunny cups are sure to add that extra something something to anyones Easter Brunch. They make the perfect added bonus gift to any brunch. 6. For Grandparents who live afar: Our Grandparents grew up in a time where you gave a card for everything. I still get a card from my grandparents every holiday and birthday, wishing me well and making me $5 dollars richer (HOLLA!). As a parent myself now, I value the importance of family and staying in touch. Don’t forget about those grandparents that live away and can’t be where you are this Easter. We have a HUGE selection of cards to help you and don’t forget, adding a picture to your cards scores you extra brownies points!! Cards truly are the perfect gift! 7. For your Mom/Friends clubs: I’ve always wrote down my honey do’s on random pieces of paper, cluttering up my kitchen and the deep corners of my purse. I recently invested in a cute notebook that I can tote around anywhere. It has come in handy so many times, and as busy moms, it’s a great thing to have on hand to remind you to pick up that random item you needed at the store…okay you don’t have to be a mom for that, that’s just busy working girl mode! Notebooks make a great gift and when they are super cute like this gold stripe one, everyone will want one. 8, 9, 12. For the perfect Easter Bunny Gift: Playing Easter Bunny this year. Jelly Cats are so the way to go. As darling as they are, they are also so incredibly soft. Any child would want to cuddle up on one of these bunnies. They make the perfect staple to any Easter Basket. 10. For Kids at an Easter Egg Hunt: If you have any easter egg hunts coming up, these bunny hats make the cutest addition. They wear like any party hat, and are so cute to see on your littles out on the battle field. 11,13. For the Dessert display: Looking for something to spice up that carrot cake or jello mold? Meri Meri always brings there A game when it comes to cake toppers. There Easter Bunny one really takes the cake too! They also have a cupcake kit that any kid will love to help decorate! This makes a great gift for the baker in your life or a hostess gift! Easter is two weeks away and we are hopping with excitement! 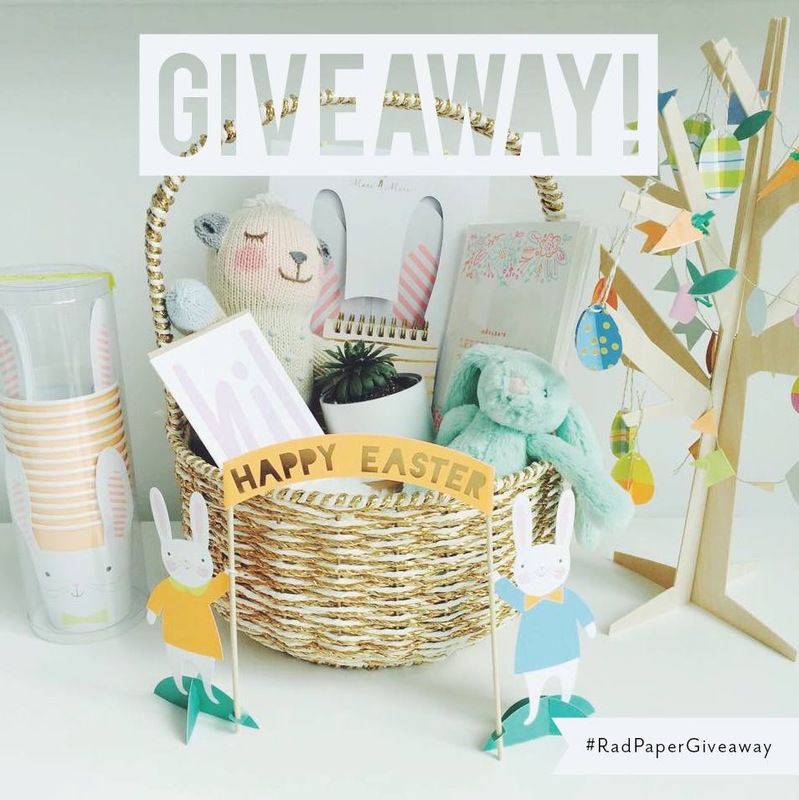 Making Easter baskets for our little bunnies got us in the mood to give away one SUPER AWESOME Easter basket to one lucky person!! Contest will START Friday, March 20th, and END Friday, March 26th…and YES, everything is included. Here is what you will find in our Easter Basket Valued at almost $200! 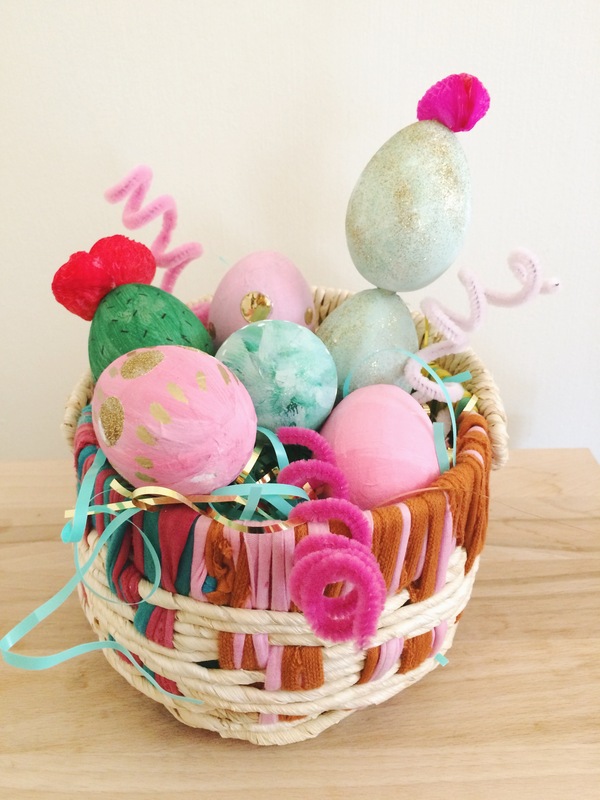 -Amazing Gold Metallic Easter Basket is from Target! Here is something that we haven’t told you yet. If you tag three friends, then you’ll be entered twice! Good Luck and Thank you, Thank you, from the bottom of our hearts for entering and supporting our small business! Easter is literally right around the corner, sorry St. Patty, and we have been super busy putting out all our new Easter goods in the store. You guys, LITERALLY, the cutest wittle bunnies you ever did see. We all have baby boys and are stuck giving them white or brown bunnies, but ladies with baby girls, GET IN HERE NOW! They’ll go fast. Enough about bunnies, lets talk about your egg game for this Easter. While scouring the isle of Target, we came across these craft eggs and instantly had a light bulb. While the possibilities are endless, we narrowed it down to three things, cactus and pineapples and paints. 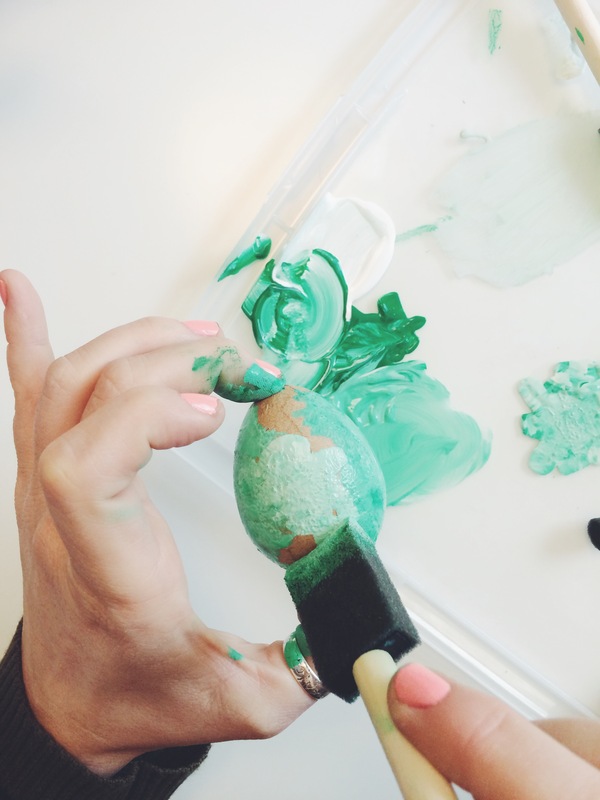 Now we know painting eggs can be a commitment of a craft night, but we also know that our Monday nights just opened up now that the bachelor is over. #teambecca You can still get together with your girlfriends and a bottle of wine and let the creativity come to life. We personally love doing these projects with other friends because everybody brings something fresh to the table….and you can steal the really cute ideas for yourself! Here is a, not so quick, but totally worth it, DIY! 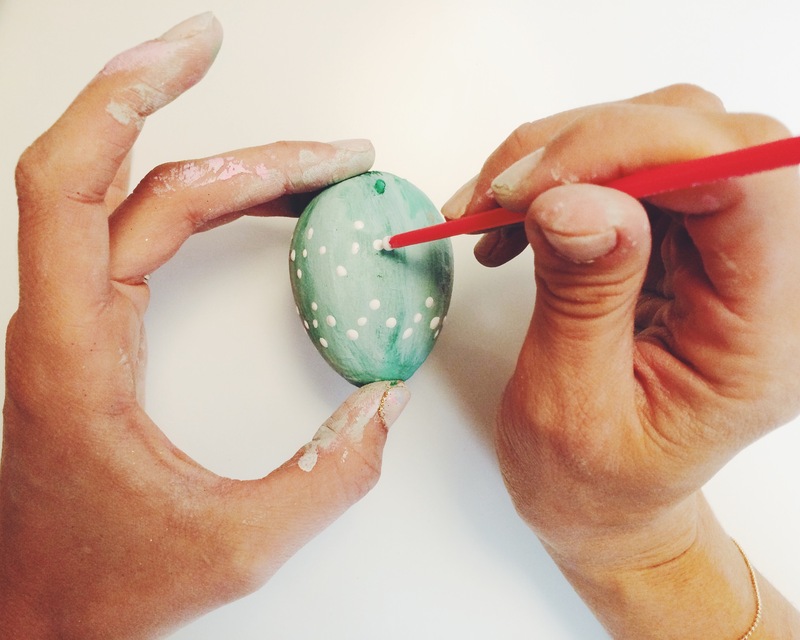 First, you’ll want to start painting your eggs. We used a plastic lid and just started squirting colors on it. We chose to work with one mint color and one pink color and one orange color. 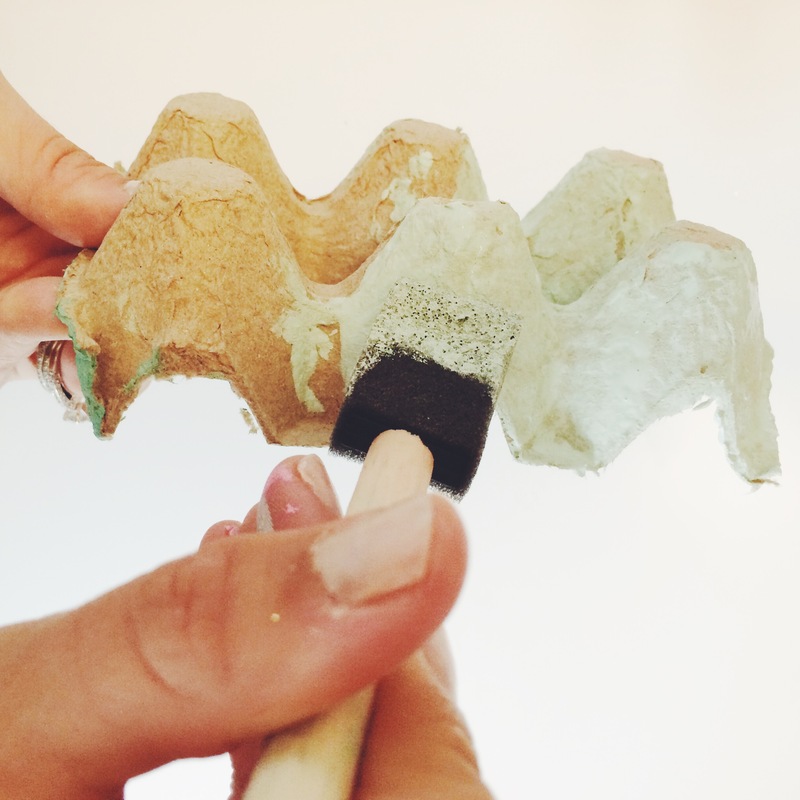 You can use white or black paint to make the colors darker or lighter, but still keeping it in the same hue family. The paint drys moderately fast and is washable! For the cactus’, you’ll want an assortment of greens. 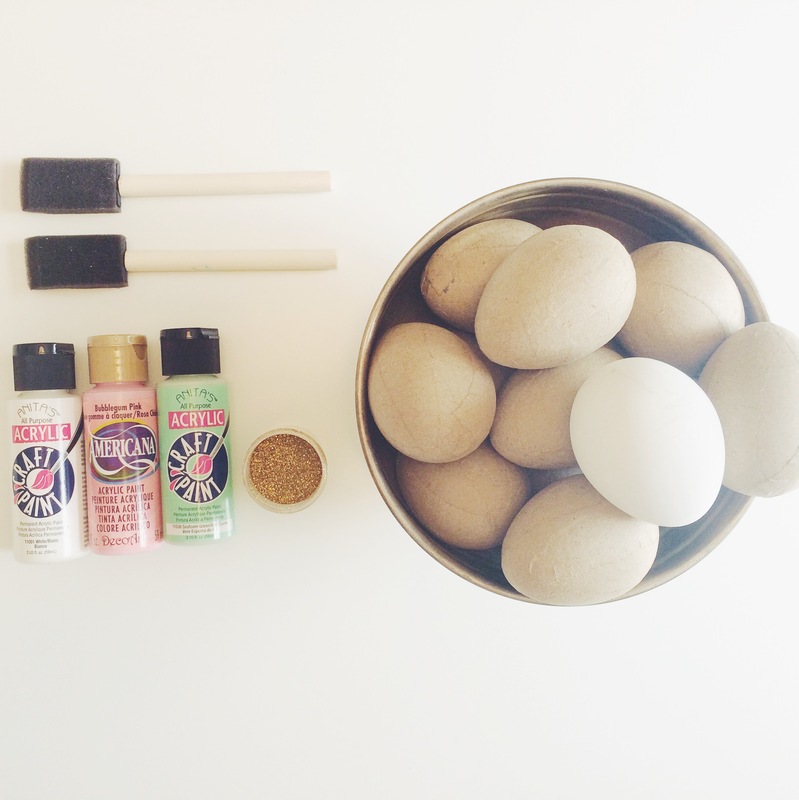 While the paint is wet, decide what eggs you want glitter on. For the pineapple, we definitely knew we wanted glitter and for some of the cactus. If you are undecided about the glitter. You can always use a spray adhesive later on to adhere the glitter. This just helped us skip that step. Plus you can never go wrong with to much glitter. For our “tall” cactus we wanted to stack the eggs. We used toothpicks and poked holes in a top and bottom of an egg. 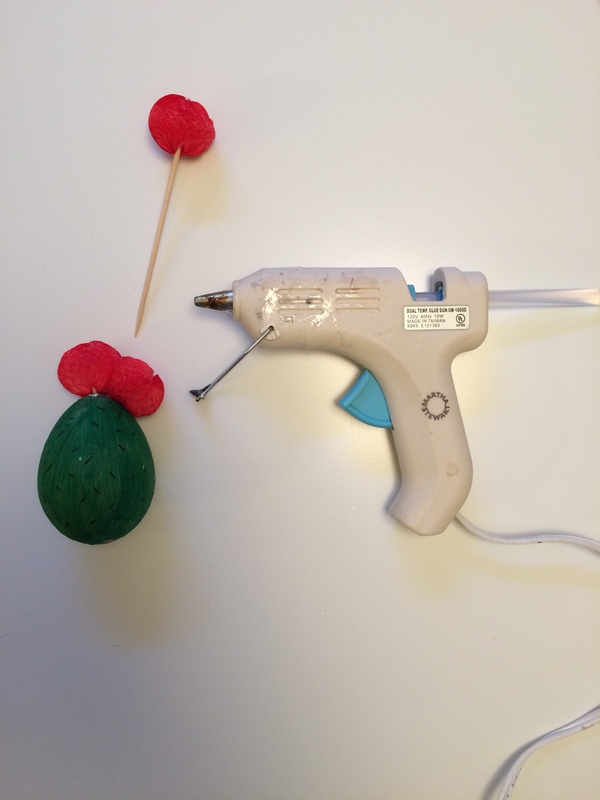 We then hot glued the eggs together for extra support. We found these pom pom toothpicks at hobby lobby and stuck them in the top for the desert flower. We used a pen to make little hash marks all over. The pineapple was super simple also. we took a gold pen and made half circles all over the egg. Then took the tip of a paintbrush and added polka-dots right under the half circles. 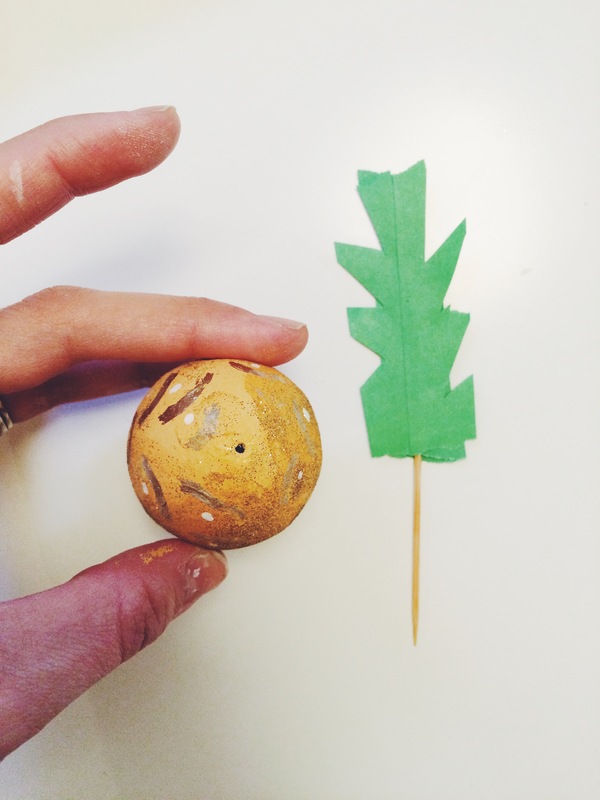 We cut the leaf top out of green wasabi tape, then taped it to a toothpick. After that, creativity really started to flow. Adding polka-dots was so easy that we wanted to polka everything. Patterns started to form. Our advise, keep is SIMPLE! It’s the easiest and achieves the most cuteness. We have a couple “ick” eggs that didn’t make the cut. After painting our eggs, we wanted to display them for everyone. 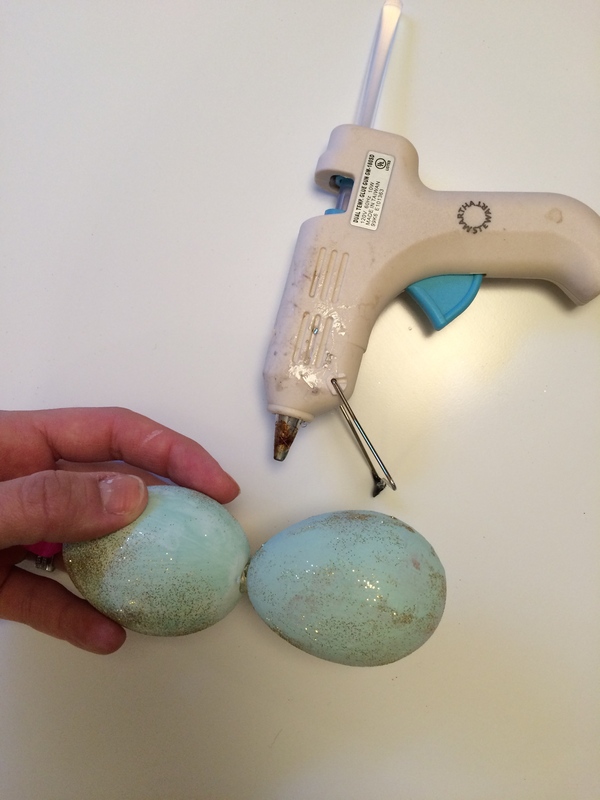 The easiest way was to use the carton they came in, but ew, the brown drab color was really bringing our cute eggs down. While the paint was still out, we quickly painted the cartons. It was super easy and took an extra five, totally worth it, minutes. 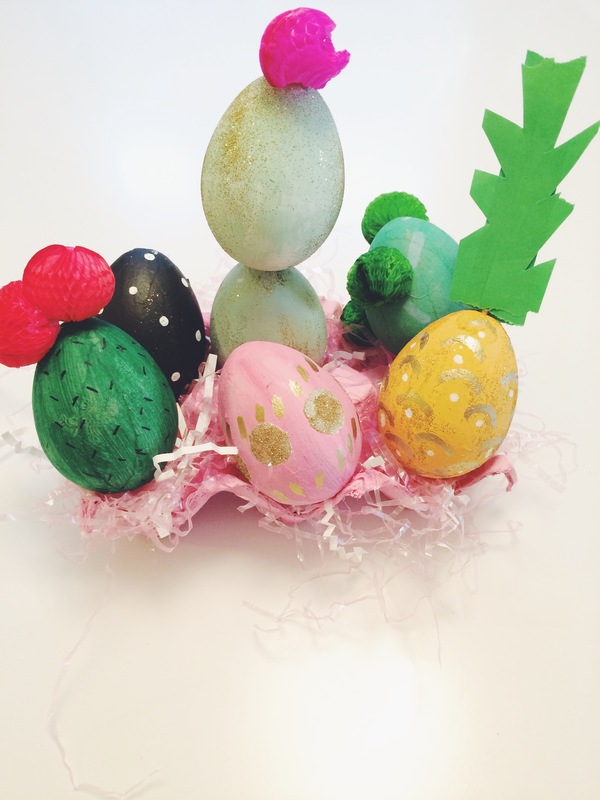 With our cute eggs and painted egg cartons, we made cheap stringy easter grass look desirable! 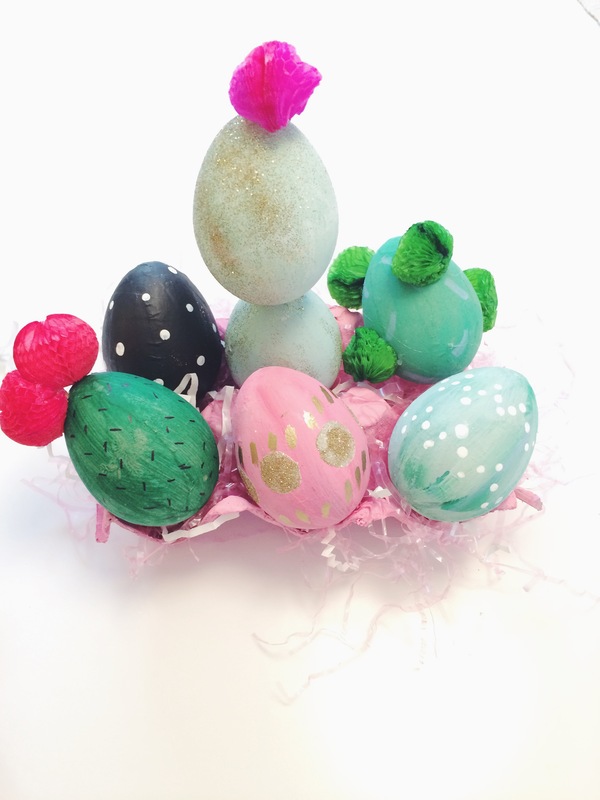 We’ll have more ideas on how to create cute easter baskets leading up to Easter so check back! 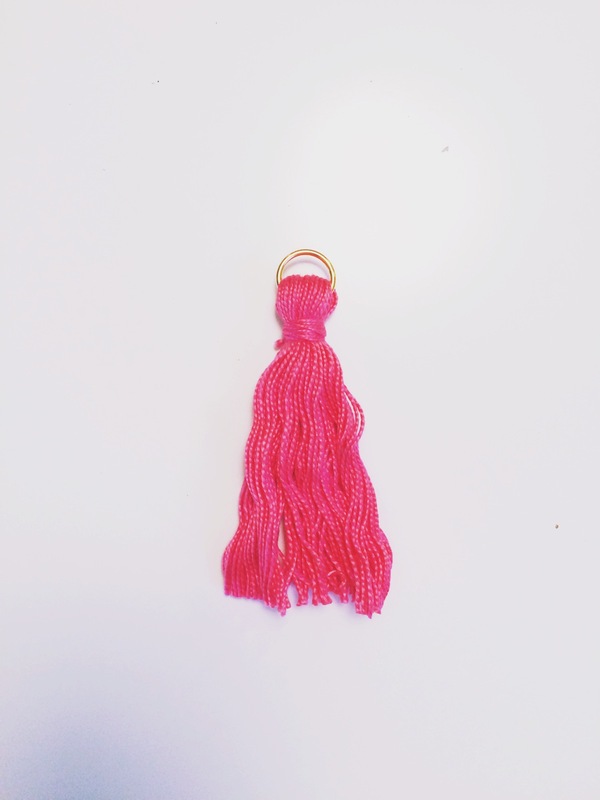 One trend that has been around for ages is the tassel. Madonna wore it, your mother tied back her curtains with it, and now it is your turn to revamp it. Anthropologie puts a tassel on just about anything. From Bedsheets, to wallets, pillows and bookmarks. 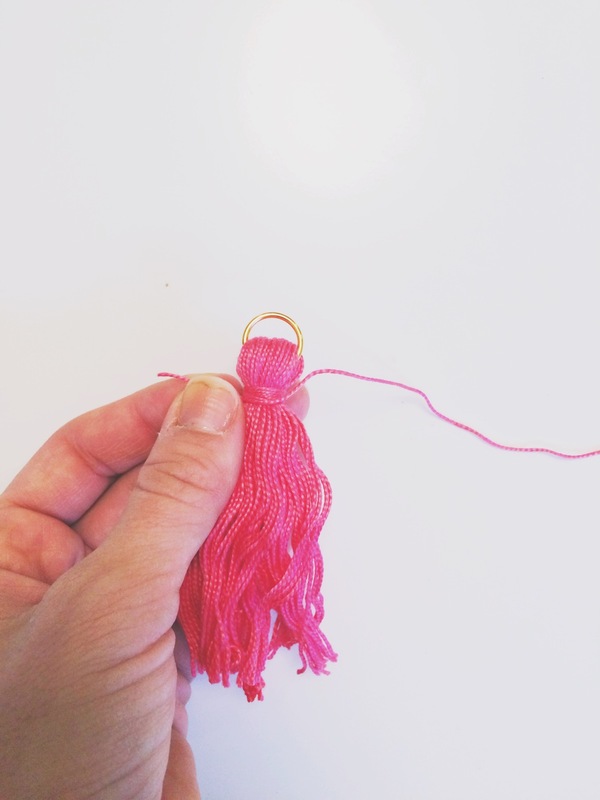 Making a tassel is SO super easy too! 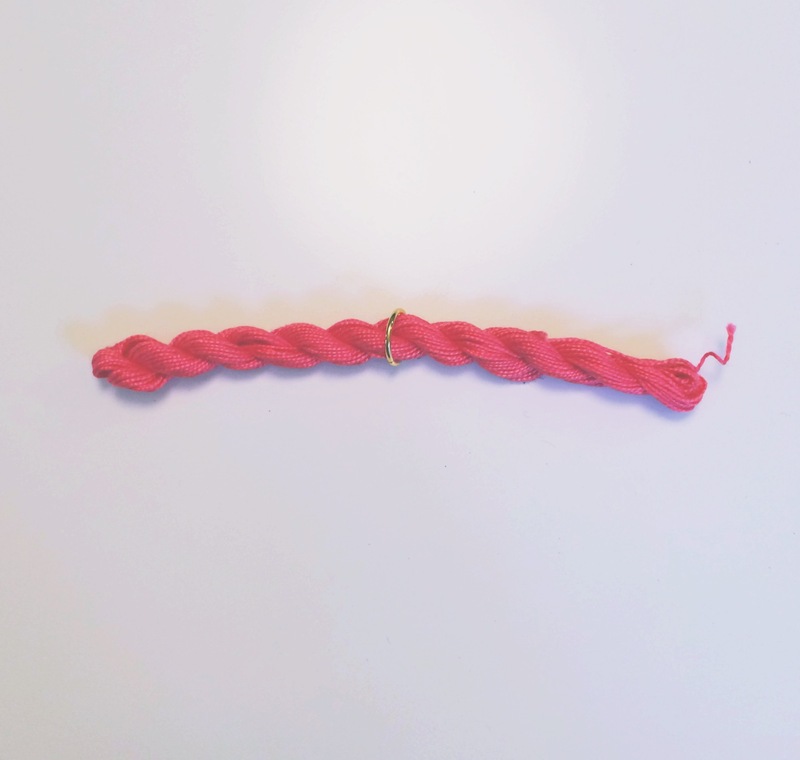 Slip the jump ring around the thread. You’ll need all the thread to make a great impact. Pull one or a couple threads loose. 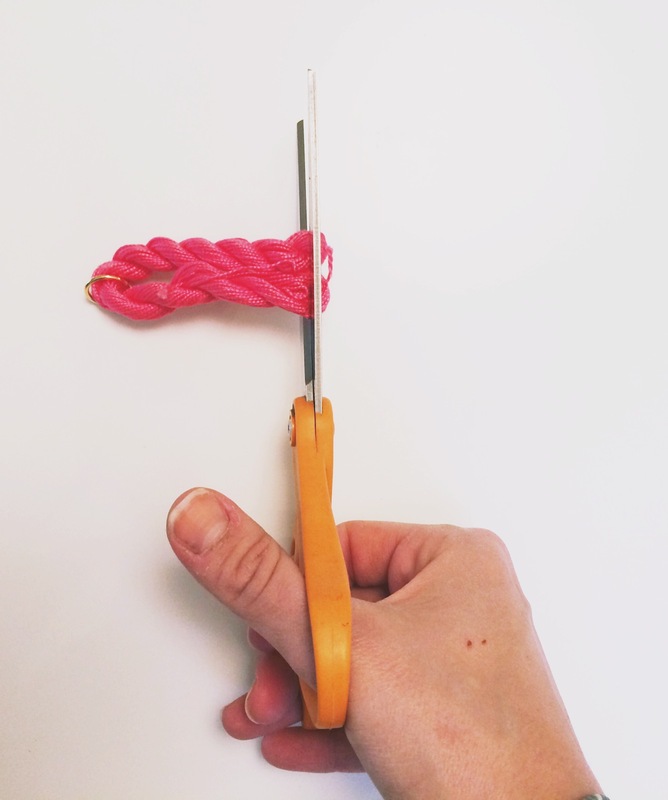 You’ll need them to wrap around the top of your tassel. 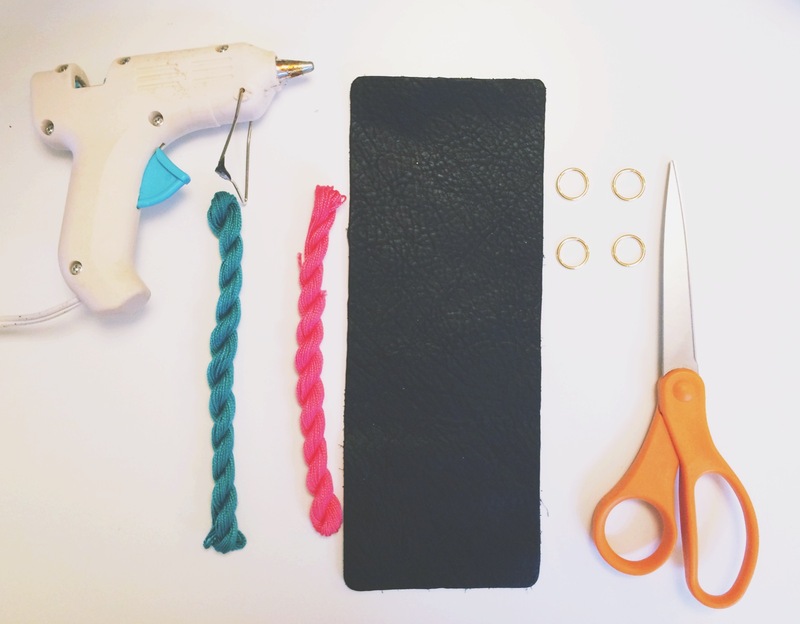 We used a jump ring, because it’s super easy to slide on to a chain necklace, add to your keychain, purse, you name it! Dare we say, wrap your invitations up with a tassel. Tassels are so fun and something that is so in right now. It took us longer to boil a pot of water than make a tassel.